Rory McIlroy fired a four-under 68 to move into a three-shot lead going into the final round of the WGC-Cadillac Championship at Doral. The world number three is 12 under par, with overnight leader Adam Scott (73) and defending champion Dustin Johnson (71) nine under. England's Danny Willett (72) is two shots further back, alongside Phil Mickelson (70) and Bubba Watson (71). 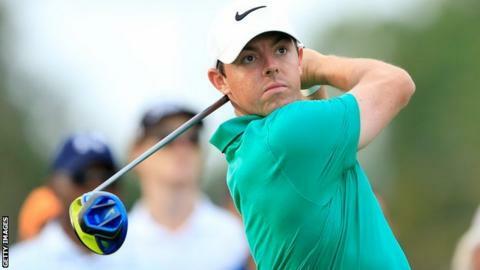 Northern Irishman McIlroy has not dropped a shot for 33 holes. He has switched to a 'crosshanded' putting method after missing the cut at the Honda Classic last week. "It was good. The wind was coming from a different direction so it made the course play a little bit tougher," said McIlroy. "I played a solid round of golf, didn't make any mistakes. I felt really good about it. I'll have to do the same thing tomorrow." McIlroy, who started the day two behind Australia's Scott, birdied the first, fifth, seventh and 10th before parring the last eight holes, sinking testing putts at the 12th and 18th. American Johnson sank a six-foot birdie putt at 16 to reach 10 under but bogeyed the last, while Scott also slipped back with a late bogey, dropping a shot at 17. McIlroy is aiming to win his 12th PGA Tour title and first since Quail Hollow last May, and his 20th career victory overall.